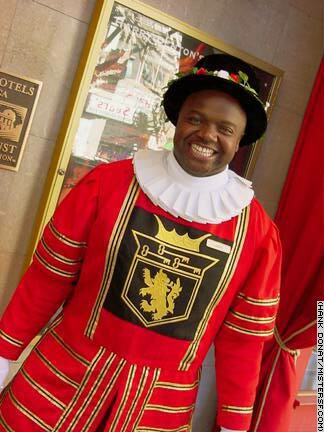 LaBan Wade is the Sir Francis Drake hotel's newest beefeater doorman and the first African-American to hold the position. LaBan beat out more than 500 competitors for the job by answering such questions as "What time does Chinatown close?" in addition to a whole host of interviews with hotel management. LaBan, formerly a doorman at the Serrano Hotel here, says the most challenging aspect of the high profile post he's held beginning in April, 2001 is the sheer volume of traffic at the Union Square location. The best part he says is working with his mentor, Tom Sweeney. By the way, Chinatown doesn't close.